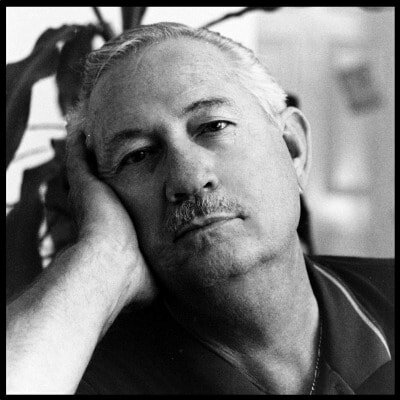 Kansas born western author, Stephen Burckhardt, grew up in and around the Wichita area. As a child, Stephen lived for a few years on a ranch near Benton, KS. Stephen got to experience what it was like to care for various farm animals, learned to drive a tractor and shoot various firearms. Stephen loved the ranch life and hopes to return to that life one day soon. Stephens was never a voracious reader of westerns but was heavily influenced by his maternal grandmother’s passion for them. While in college, Stephen worked for a big chain bookseller. He would often buy bags of paperback westerns for his Granny. Her love of these books has always stayed with him. After earning a journalism degree from Wichita State University, Stephen worked for years as a writer for several print publications, did a short stint as a writer and voice talent for a broadcast news service, and eventually tried his hand at ghostwriting fiction. Stephen was offered a contract to write a short western story for a well-reviewed western author. Stephen had never considered writing westerns but because of his grandmother’s love for them, he decided to give it a try. It was this first ghostwriting assignment that led Stephen to fall in love with the genre himself. In 2013, Stephen met and married the love of his life. Carrying the western theme into his married life, the couple was married by Stephen's mother at The Old Cowtown Museum in Wichita, KS. The wedding ceremony was held in the Presbyterian Church and the reception was held in Fritz Snitzler’s Saloon. The reception was even interrupted by gun fighters. The happy couple currently lives with their rescue dog, Shaggy. Margret MacBride loves her children more than life itself, but as a young widow, she can't support herself and her children on a maid's salary. After losing their home they struggle for years to survive living on the streets. Distraught, Margret turns to the church for guidance. Sister Mary Agnus convinces Margret her children will be better off if she turns them over to the Catholic Foundling Aid Society for placement in a home. 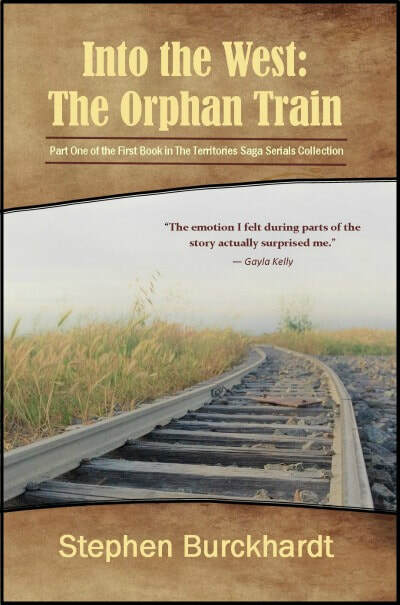 Little did she know her children would end up on the Orphan Train heading into the western territories. Taken from the only home they have ever known, Elizabeth and Conner MacBride are frightened and homesick. Their aid worker, Mrs. Kelly, does her best to comfort the children and help them come to terms with their new situation. When Elizabeth finds herself in trouble after a run-in with the foundlings' home's director, Sister Mary Clare, and bullied by one of the other children, Mrs. Kelly puts her job on the line to get Elizabeth and her brother on the Orphan Train and find them a new home in the Wild West. Thanks to their case worker, Mrs. Kelly, Elizabeth and Conner MacBride make it onto the orphan train heading into the west. Mrs. Kelly is reluctant to part with the children as she struggles with the agreement she was forced to make with Sister Mary Clare to keep the children on the train. If Mrs. Kelly keeps her promise she will keep her job but she may break the hearts of Elizabeth and Conner in the process. As the train heads into the Kansas territory to make one final stop, Mrs. Kelly must choose, place the children with strangers or return them to the Catholic Foundling Aid Society's home in New York City, something she does not want to do. 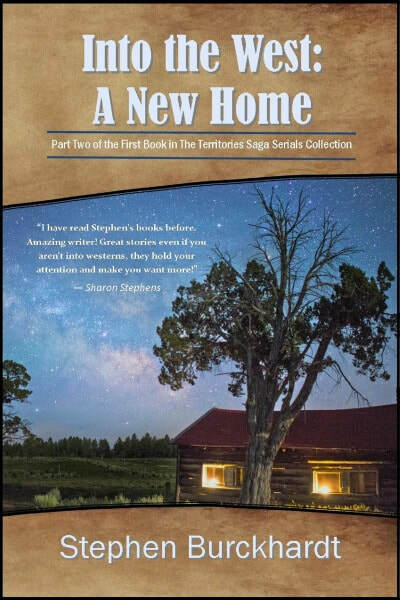 Finding a new home in a small cowtown in the Wild West will be a new and frightening experience for Elizabeth and Conner but with the help of a few good people they might be able to make a new life for themselves. Will Mrs. Kelly have to sacrifice her job to do what she believes is best for the children or can she find a solution with which they can all live? Families in Sharon Springs are dealing with ghosts from their pasts as they consider welcoming the riders of the orphan train to their town. Many old wounds need to heal if they are going to make room for Elizabeth and Conner MacBride. Unfortunately, things do not work out as Mrs. Kelly had hoped and it may turn out that the only way to find suitable homes for MacBride children is to split them up. When Elizabeth and Conner learn they are being placed with different families in Sharon Springs, both are heartbroken. After many tears and promises the siblings would get to see each other as often as they wanted, things begin to quiet down. When Elizabeth meets her new family, she finds out Tim Ruth was much more thrilled to have a new daughter in the family than his wife, Stacy. Her new adoptive brother, Timothy, does not give her a warm welcome either. Life in the Wild West can be hard, especially when you’re alone and not everyone in your new adoptive family doesn’t seem to want you there.